Homelessness is on the rise in the United States for the first time since 2010, with both Los Angeles and the entire state of California hit particularly hard by what has become a full-blown humanitarian crisis. Los Angeles witnessed a 20 percent increase in the number of people experiencing homelessness from 2016 to 2017. We know how to solve, or at least greatly reduce, chronic homelessness in Los Angeles: Permanent Supportive Housing (PSH). So what’s stopping us from creating more PSH? Why is it taking so long and costing so much? The simple answer is that we need to start constructing these projects concurrently instead of one at a time, and with a unified strategy. 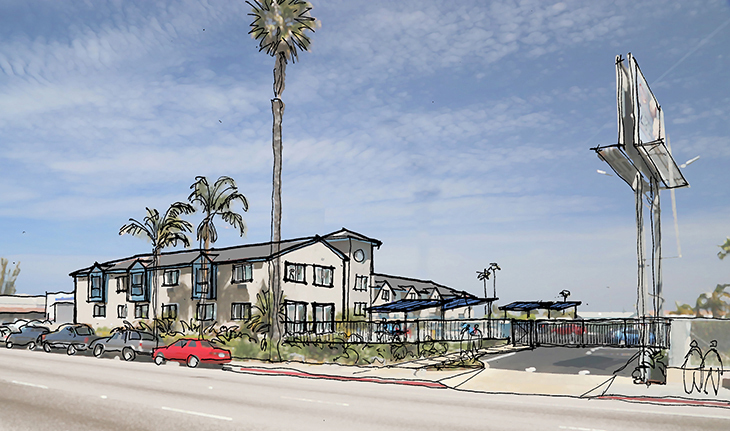 Street view sketch showing the transformation of a Super 8 Hotel into a Transitional Housing Facility. Image © Gensler.